The federal government’s home mortgage insurance program is finally back in the black, having improved materially over the past year, yet its insurance premiums remain at record-high levels. Our analysis indicates that that Federal Housing Administration (FHA) can significantly lower its premiums—charging current borrowers more appropriately for their risks—while continuing to build the necessary reserves against future losses. Today’s high premiums penalize current borrowers for the pricing and performance of the earlier vintages and the deficit in the reverse mortgage program—the two main causes of the fund’s continuing inability to meet its 2 percent congressionally mandated reserve ratio. Since 1934, the FHA’s home loan insurance has been a major source of financing for the single-family housing market, particularly for minority, low-income, and first-time homebuyers. FHA insurance provides approved lenders with financial relief when borrowers default on their mortgages. The FHA currently has 4.8 million insured single-family mortgages in its portfolio. The FHA is designed to operate without funding from taxpayers, relying instead on the Mutual Mortgage Insurance (MMI) Fund to meet its obligations to lenders when borrowers default. The MMI Fund is financed through the premiums paid by mortgage borrowers for FHA mortgage insurance. After the crisis, the MMI dipped into negative territory as projected claims began to outstrip projected revenue. The FHA took steps to address this deficit by tightening its standards and raising its fees. In November 2014, the FHA released its annual actuarial report, showing that the MMI had improved materially in the last year and would end the year with $4.8 billion in value. The results were, however, less favorable than the 2013 actuarial report had predicted: an estimated $10 billion less net worth for 2014. These results push back the FHA’s return to its congressionally mandated minimum of 2 percent in capital reserves to 2016. Our analysis released today on the 2014 Actuarial Report on the FHA MMI Fund explains that the MMI’s failure to meet the 2013 predictions was driven primarily by negative revisions to the economic value of the Home Equity Conversion Mortgage book, poor performance of loans made before and during the financial crisis, and a shortfall in revenues driven in part by today’s higher premiums. The mixed message of the actuary—showing an agency whose business continues to improve, though not as quickly as had been expected—raises the question of whether the FHA can afford to lower their historically high insurance premiums, expanding access to credit and avoiding, at least in part, a worsening adverse selection problem (see page 33 of our monthly chartbook). We reviewed the economics of the credit mix of FHA’s current and desired books of business to answer this question. Even with a slight decline in credit scores between 2012 and 2014, current scores are considerably higher than they were before 2007. In May 2014, in proposing a supplemental performance metric, the FHA indicated a preference to move its book of business somewhat lower in the credit spectrum. 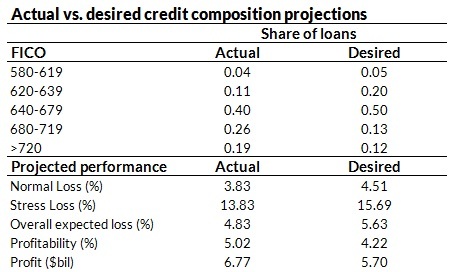 In assessing the likely performance of these books, we looked at defaults (a mortgage over 90 days delinquent) under two different scenarios: those with normal and stressed economic conditions (see tables). For the normal scenario, we used the 2001–2002 default rate and assumed that these defaults resulted in a 50 percent loss in value by the FHA. For the stressed scenario, we used the 2005–2006 default rate and assumed that these defaults resulted in a 65 percent loss. These severity numbers are conservative (high) and consistent with severities reported by the FHA, but do not reflect that not all loans that go severely delinquent will result in an FHA insurance claim. Assuming a weighted-average time to repayment on an FHA loan of six years, a fairly reasonable estimate, the FHA can expect to collect the 1.75 percent up front premium plus 8.1 percent in annual premiums, bringing total revenue to 9.85 percent. Assuming losses of 4.83 percent, the expected profit is 5 percent. Assuming the FHA newly insures in 2015 the same $135 billion as 2014, this year’s book can expect to make $6.8 billion in profit. If the FHA achieves its desired mix, which includes more 620-680 FICO borrowers and less borrowers with FICOs over 680, also shown in Exhibit 2, our analysis suggest that it would have an expected loss of 5.6 percent. This in turn would result in an economic value of $5.7 billion. Netting $2–$3 billion in 2015 is a more appropriate pace that won’t overcharge new borrowers to make up for undercharging in the past. If the FHA’s ultimate goal is to break even with each vintage, there is a room for a significant premium cut. Even if it succeeds in taking on a much broader book, with a greater number of higher risk borrowers and expected losses, the FHA could cut annual premiums in half, from 1.35 percent to 0.65 percent, and still break even. (This calculation ignores the increase in higher credit score borrowers that would move into FHA mortgages if premiums were to be so dramatically altered. With the MMI fund still well below its reserve ratio (the MMI fund has a reserve of $4.8 billion, versus a $23 billion requirement), a key question is to what extent, and how quickly, new, forward vintages should pay the performance and pricing of older vintages and the deficit in the reverse mortgage business. 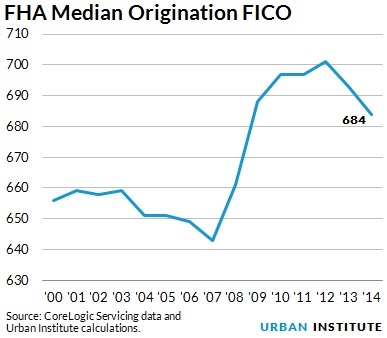 In essence, should the FHA continue to overcharge new borrowers to make up for undercharging older ones? In answering this question, it is important to note that maintaining higher premiums leads many of the FHA’s better credit borrowers into alternative channels, leading to less revenue and a more costly credit mix. It makes sense to make up the shortfall more slowly, pricing new business more appropriately for the risk. Thus, rather than attempting to make $5.7–$6.8 billion with its 2015 book of business (depending on how quickly the desired mix is achieved), it would serve the FHA better to lower the premiums and achieve the reserve at a more gradual pace. If the FHA lowered the annual premium on the 2015 book to 0.9 percent, it would make $2.0–$3.1 billion, depending on the loan mix. While that may not be the right number, we believe the wisest course of action is some reduction in the insurance premium, with the exact amount depending on the FHA’s own internal estimates and policy preferences.